Find artworks, auction results, sale prices and pictures of Vasili Dimitrevich Polenov at auctions worldwide. Description: POLENOV, VASILY The Vault under Al-Aqsa Mosque. Temple Mount, Jerusalem, signed. Oil on canvas, 69.5 by 92 cm. Provenance: Collection of Nicolai Ghiaurov (1929-2004), a Bulgarian opera singer, from the 1970s. Thence by descent. Private collection, Europe. Authenticity of the work has been confirmed by the expert V. Petrov. The picture now presented for auction, The Vault under Al-Aqsa Mosque. Temple Mount, Jerusalem, was painted by Vasily Polenov in 1899-1900s, following his second great journey to the Middle East, where he went in 1899 to gather material for the grandiose Gospel series From the Life of Christ. His route lay through Constantinople, Athens, Smyrna, Cairo and Port Said, and then onwards to Jerusalem and Beirut. The culminating point of the journey for the artist was his stay in the Holy Land, since his desire to go on the trip had been prompted by the need to see once again, at first hand, the location of the events recounted by the Bible, studied during his first visit to the Palestine in 1881-1882. He again returns to the Al-Aqsa Mosque, which had been called Solomon's Temple since the time of the Crusaders. The present composition is linked to a visit that Polenov paid to the square on the site of the destroyed Temple of Solomon. In his letters home, he enthusiastically wrote home about that square: "How many interesting and beautiful things there are; but the best of all is the square of Solomon's Temple... I have not seen anything grander except, perhaps, for the Eski Saray Hill in Istanbul." 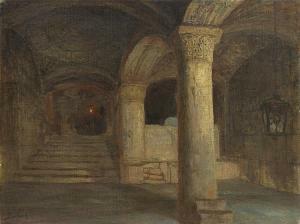 The interior in the composition is the underground level of the Al-Aqsa Mosque (the so-called "Solomon's Stables"), a vaulted structure that, according to legend, survived when Solomon's Temple had been destroyed by the Romans in the first century A.D. On a small, first version of this composition, executed in 1881, there is even an inscription in Polenov's handwriting: "the so-called Solomon's Basement". It comes as no surprise then, that Polenov, who was interested in the "biblical" layer of Jerusalem's architectural monuments, was drawn to this very ancient part of the vast mosque complex. The view of the stately ancient vault opens up through a dim archway - a technique pioneered by Polenov in his depictions of the interiors of the Church of the Holy Sepulchre and its lower level, the Chapel of Saint Helena. The ray of sunlight that illuminates the carved capital of the arch abutment directs the gaze, towards the back of the composition, where there is a dark stairway and an enticing small spot of bright light from the hanging lamp. The space of the church is visually expanded through the sweeping curves of the arches, positioned sideways and backwards, yet its outlines are concealed in the dimness in the corners and passages. Compared to its study, which is suffused with light but is far more general and less detailed, the present composition seems to be far more complete and "picturesque". 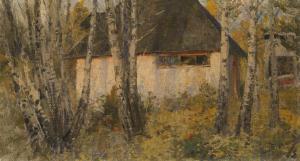 Polenov deliberately emphasises the subterranean character of the interior and dramatises its architectural space. This interpretation is reinforced by the fact that the Muslim quarter, in which the Temple Mount and the Al-Aqsa Mosque were located, was not so easily accessible to Christian travellers in the 19th century. Opportunities to officially visit - and subsequently to depict - the interior of the mosque came about rarely and were highly valued. This is why it is so hard to find in European and Russian painting other examples of the images of the Al-Aqsa Mosque. The appearance at auction of such a significant work from Polenov's celebrated series of images of the Holy Land sights is a rare, outstanding event. Description: POLENOV, VASILY (1844-1927) Jesus Christ with Mary Magdalene, signed. Oil on canvas, 141.5 by 89 cm. Provenance: Private collection, Europe. Authenticity of the work has been confirmed by the expert V. Petrov. Related literature: For another version of the present lot, see V. Polenov, Iz zhizni Khrista, Moscow, 1909, illustrated. V. Polenov, Iz zhizni Khrista, Moscow, 1912, illustrated. Iz zhizni Khrista. Evangelskii tsikl V. D. Polenova [digital edition], Moscow, the State Tretyakov Gallery, 1996, illustrated and with the artist\’s annotations. Jesus Christ with Mary Magdalene, like another canvas which is being offered at auction by Mac Dougall\’s, He Resolutely Set Out for Jerusalem, belongs to the renowned cycle of paintings by the Russian artist Vasily Polenov, From the Life of Christ. This monumental series of works, devoted to the Saviour\’s earthly life, took up 40 years of Polenov\’s own life and is the core of his artistic legacy. Jesus Christ with Mary Magdalene is known in several different versions, none of which have previously appeared on the art market or are represented in Russian museum collections, so the inclusion of this canvas in the Mac Dougall\’s auction is an unprecedented event. 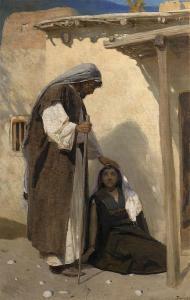 Polenov painted the first work of his evangelical cycle, Christ and the Woman Taken in Adultery, in 1888. However, the idea of the cycle dates from his student years, when the artist\’s diploma work at the Imperial Academy of Arts was the painting The Raising of Jairus\’ Daughter (1871), for which he was awarded the Academy\’s gold medal. Polenov returned continually, throughout his life, to the story of the Messiah\’s life on earth, and the relationship of the Saviour with the female personages of the New Testament is one of the cornerstones of his work. Although Mary Magdalene appears only occasionally in the Gospel narrative, she is one of the most important female characters of Polenov\’s cycle From the Life of Christ. She is the main protagonist of at least three canvases: Jesus Christ and Mary Magdalene, Mary Was Standing Outside the Tomb (1889–1909) and Announced the Joy to the Crying (1899–1909). She is also a staffage figure in Magdala and is most probably among those depicted from the rear, watching the scene of the crucifixion, in the composition Golgotha. Stood Far Away (1909). The importance lent by Polenov to the image of Mary Magdalene is all the more remarkable when we remember that she appears extremely rarely in traditional Orthodox iconography. Her image is only to be found in late Greek icons, in which the influence of Western European models can be observed. Her only role in Russian secular painting of the 19th century is in the scene of Christ\’s appearance to Mary Magdalene after His resurrection, as in the painting by Alexander Ivanov The Appearance of Christ to Mary Magdalene after the Resurrection (1835). Polenov, on the contrary, prefers other, less canonical subjects, the first of which is the healing of Mary by Christ, referred to briefly in St. Luke\’s Gospel: \“Mary (called Magdalene) from whom seven demons had come out\” (Luke 8: 2). The scene of the healing of the possessed woman is preceded in Polenov\’s cycle by a landscape composition, Magdala, which portrays the Saviour\’s journey towards Mary in the town in Galilee from which she took her name. Here, determined to seek out the historical truth in the image of Christ, the painter shifts his focus from the events of sacred history to their perpetual witness – the world of nature. 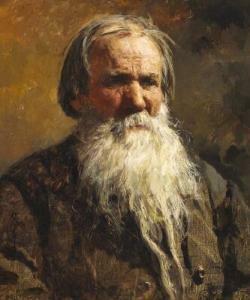 Polenov travelled twice to Palestine (when working on Christ and the Woman Taken in Adultery and then again before starting on the Gospel cycle), where he followed in the footsteps of Christ on earth, learnt the realities of life in the Middle East, drew sketches, took photographs, collected costumes, and studied architecture, everyday life and the natural world. Polenov\’s representation of the meeting between Christ and Magdalene is undoubtedly based on his actual observations during his travels in Palestine. The picture Magdala shows the young woman in the distance, on the threshold of her home, and the figure of Christ approaching her along a winding desert path. However, the work is first and foremost a landscape. Its main features are the sun, the scorched earth, the mountains in the distance, olive and palm trees, and, of course, a Middle Eastern dwelling, a replica of its actual physical prototype, unchanged, according to the artist himself, since the dawn of Christianity. In Jesus Christ with Mary Magdalene, the next picture in the cycle, the painter zooms in, almost cinematically, to show us the event in close-up. The format of the canvas changes from panoramic horizontal to vertical, and the action unfolds before the spectator on the doorstep of Magdalene\’s home. Polenov described the scene as follows: \“Mary sits at the entrance to her dwelling, Christ approaches her with His staff and lays a hand on her head. She fixes her eyes on Him\” (Polenov Archive, Manuscript Section of the State Tretyakov Gallery, file 54). There are significant differences between the several known versions of this scene. 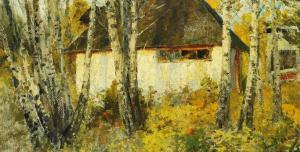 In the version published in the Prague Album of 1912 mountains and sky are visible in the distance above the roof of Mary\’s house. This image has been reworked in the canvas, which is offered at auction. The scene is brought even closer to the viewer. Hardly any space is left for mountains and sky, and all attention is focused on the miracle of healing. What were merely staffage figures in the 1912 version are now protagonists: instead of a woman in black robes we see Mary, and the expression on her face and the figure of Christ are brought out more precisely and distinctly. A blue headscarf falls from Christ\’s head in delicate folds. While in the first version different colours are used to represent different substances (the sand on the road, heated by the sun and the mud walls, the mountain ridge and the sky bleached by the dazzling light), in the present work matter and people merge in a single colour spectrum. It is important that, in Polenov\’s interpretation, Christ appears without a halo, and there are no witnesses of the miracle, except for surrounding nature. Polenov\’s heroes are free from the romantic and orientalist clich s, which influenced the depiction of biblical characters in the academic painting of his time. As Yakov Minchenkov, a fellow artist and contemporary of Polenov, wrote: \“His Christ ... is wise and beautiful in His simplicity – a poet, a dreamer, intent on building the Kingdom of God, the kingdom of the human spirit and justice on earth. For him [Polenov] this living image leads a human life alongside other people, rejoices, mourns, feels anger and dejection, and finally goes to Golgotha, without relinquishing the tiniest part of his convictions. He has stripped Christ of the divine and the ecclesiastical, making him a carpenter, a friend of fishermen and a zealous preacher\” (Yakov Minchenkov, Vospominaniia o peredvizhnikakh, Leningrad, 1980). Healed by the Saviour, Mary becomes one of the first women to follow him and the main female protagonist of subsequent paintings in the cycle From the Life of Christ. The picture Jesus Christ with Mary Magdalene is one of the pivotal works in the series, and is among the most interesting paintings of Polenov\’s latest period. Provenance: Sotheby\’\’\’\’\’\’\’\’s London, May 1980 (label on the reverse). Cornette de Saint Cyr Paris, March 1985 (label on the reverse). Acquired at the above sale by a previous owner. Collection of Lode van Rijn, a Director of the Khepri Gallery, Amsterdam (label on the reverse). Private collection, The Netherlands. Authenticity of the work has been confirmed by the expert V. Petrov. Authenticity has also been confirmed by the expert G. Churak.